The heartbreaking events of Good Friday did not signal the end of Jesus Christ's ministry to His disciples--far from it. His resurrection on Easter morning was the beginning of a unique and significant time in His ministry on earth. For the next forty days, until His glorious ascension to heaven, Jesus appeared many times to His followers. During this remarkable period, He taught them about the kingdom of God and explained the requirements of discipleship, His own divine nature, and the power they would soon receive to expand the kingdom of God "into all the world" (Mark 16:15). Today, we can experience that same power to accomplish God's work. Those forty days were a link between heaven and earth that is a pattern for us. As we walk with the resurrected Christ, we discover how to reproduce His life in our own experience, and we gain a new sense of His glorious reality and continual presence with us day by day. Just before His ascension, Jesus promised to be with us "all the days," even to the end of the age. 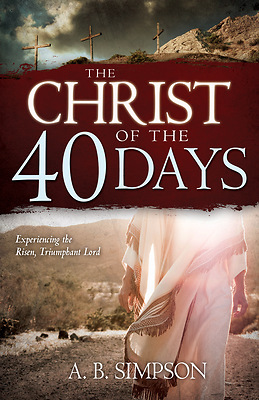 Relive those forty days with Christ, following the risen Lord to a higher place of spiritual life and victory.